We are big fans of Valentine's Day over here, in fact, we have been working on our Valentine cards for a few weeks now! The little ladies and I love decorating our house with all the hearts, pink, purple and glitter and can't wait to hand out the cutest cards this year. I was so excited when I connected with Shannon on Instagram, designer and Etsy Shop owner over at Sammi Kate Designs, you can visit her shop here: Sammi Kate Designs. Miss Emerson has a few food allergies, so this year we decided to get creative and think of allergy friendly Valentine treats, that all of our friends could enjoy! It can be pretty stressful when you're a Mama to littles with allergies, one you feel bad they can't fully enjoy all of the yummy Valentine treats and two you spend a lot of time worrying they MIGHT eat something they are allergic to. I've linked all the cards along with the treat to attach to each, most items are found on Amazon and can be at your doorsteps in just a few days OR grab them during your next Target run! Here are some of the cards that we are giving out this year, which one is your favorite!? 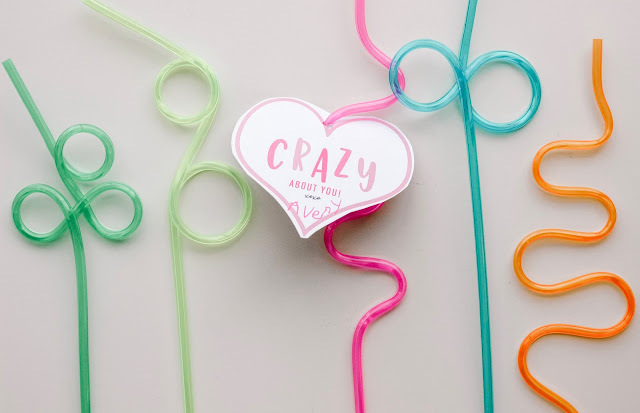 1- Crazy About You: Crazy Straws; how fun are these! Grab the straws in the party favor aisle at Target or online on Amazon. 2- Valentine You Blow Me Away: Bubbles; How perfect for our little friends who are also too young to eat candy! I found these bubbles back in the Valentine section at Target. 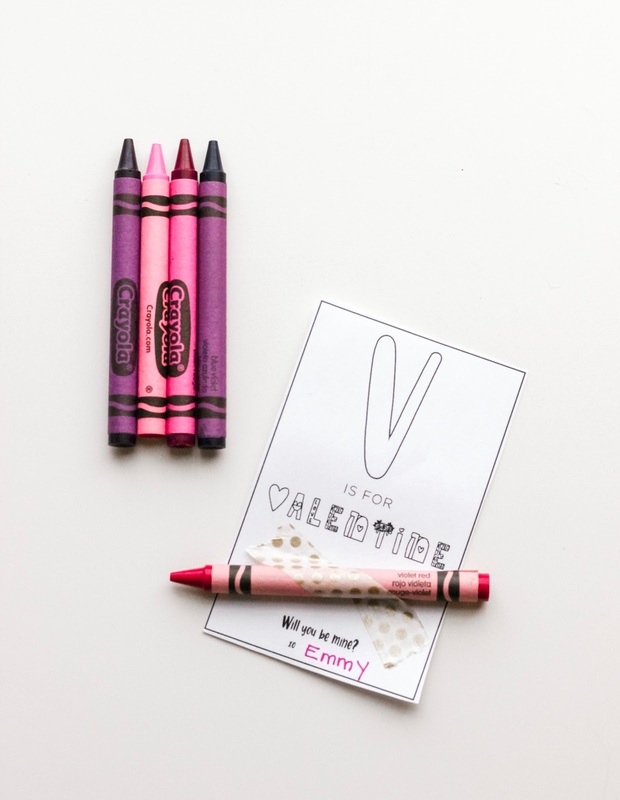 3- "V" is for Valentine: Crayons; This one is my favorite! 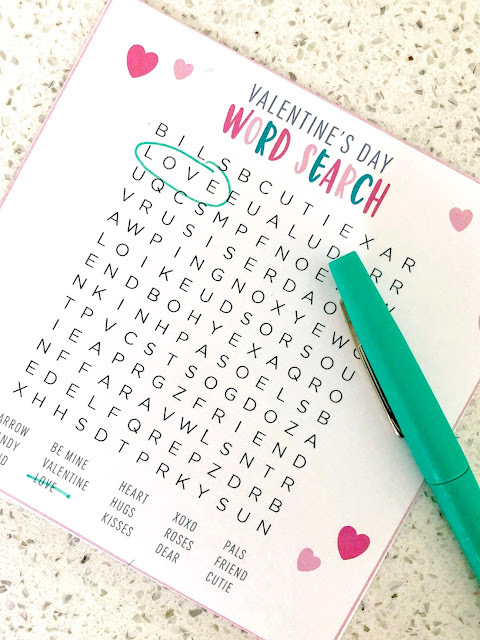 Grab a pack of crayons, tape a few on with decorative tape and you're good to go! 4- I'm a Lucky Duck to Have a Friend Like You: Rubber Duck; Seriously the cutest and such a perfect little treat to use during bath time! 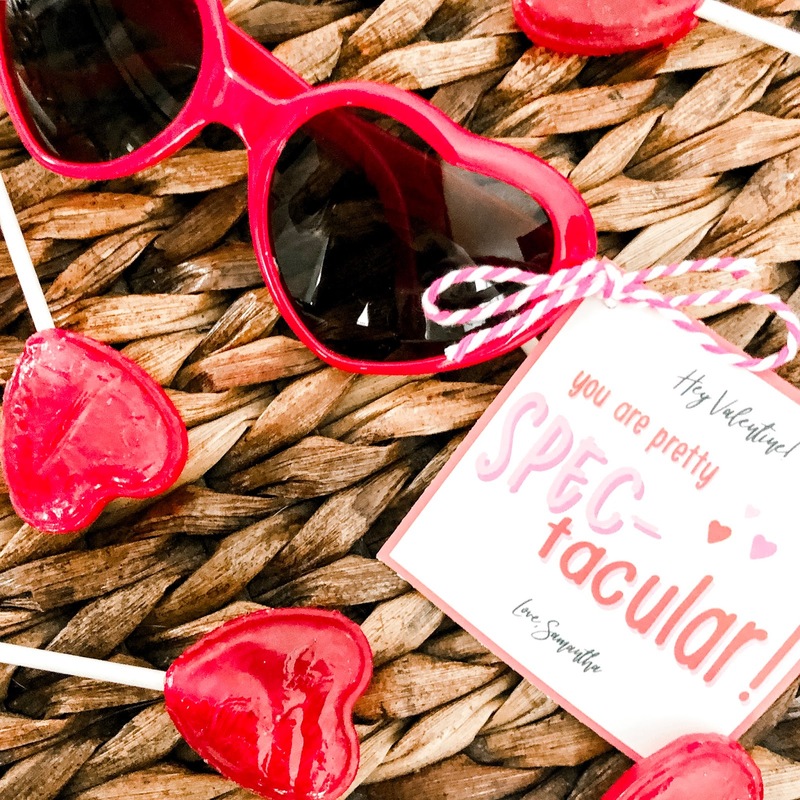 5- Hey Valentine, You are Pretty Spec-Tacular: Sunglasses; How cute are these little heart shaped sunnies!? I swear my little ladies can't get enough sunnies, these would make the cutest Valentine's Day photo props too! 6- Have a SUPER Valentine's Day- Super Hero Mask; Perfect for all the Super Hero fans, my girls are obsessed with PJ Mask and would be so excited to add these little masks to our dress up collection! 7- Valentine's Day Word Search; Shannon, the designer behind these adorable printable cards suggested printing these cute little word search puzzles off and attaching a new pack of pens for your kiddos teaches, how cute! Throw in a Starbucks card or some Fannie Mae chocolates to make it extra sweet. 8- Heart Shaped Bracelet; Emerson is in such a princess phase, she spotted these Valentine's at Target and had to have them! We grabbed a pack of heart shaped bracelets to attach. 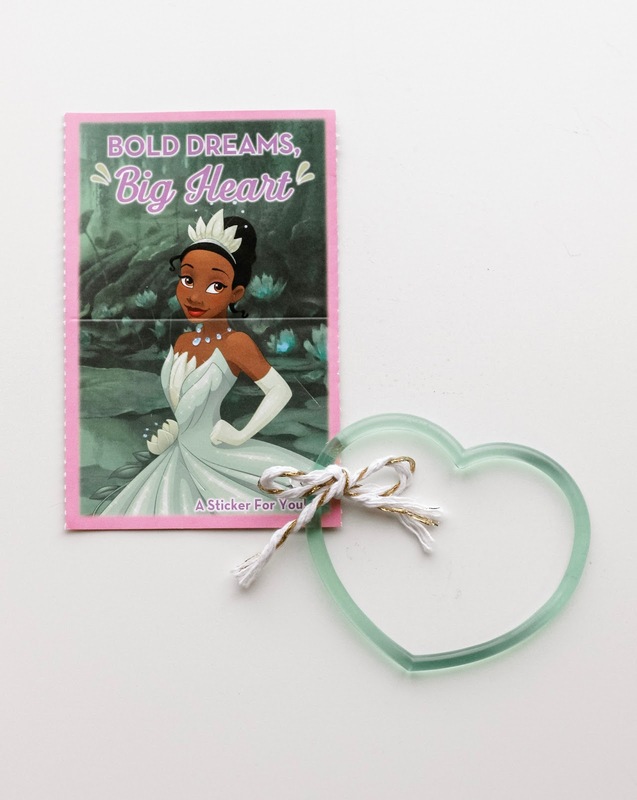 The little ladies will be handing these out to their dance friends, so perfect! 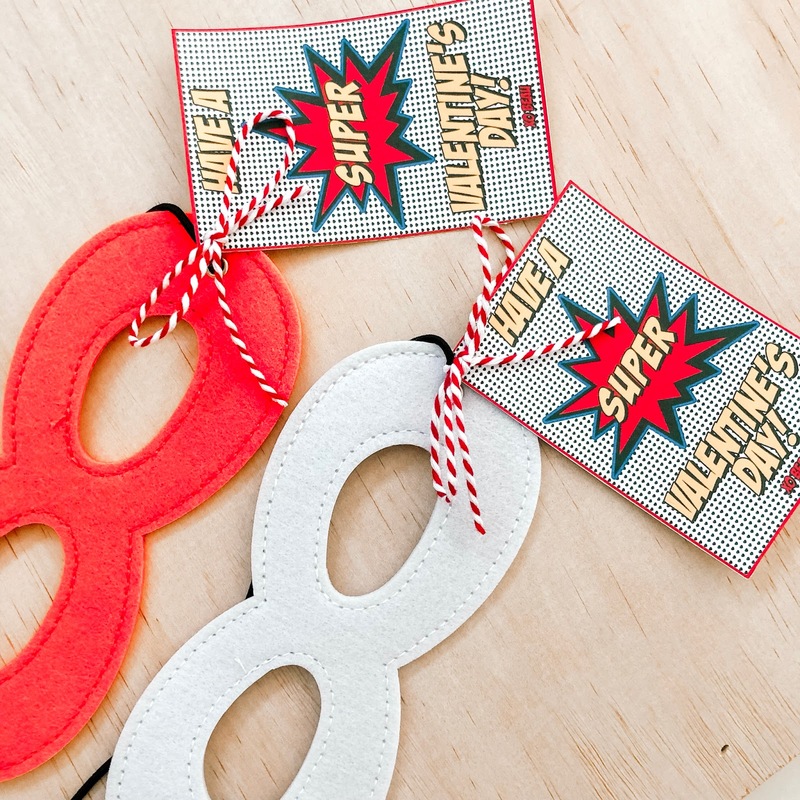 There you have it, EIGHT simple and adorable alternatives to Valentine's Day candy! I know my girls would be SO excited to get any of these treats in their Valentine's Day goodies, which one was your favorite!? 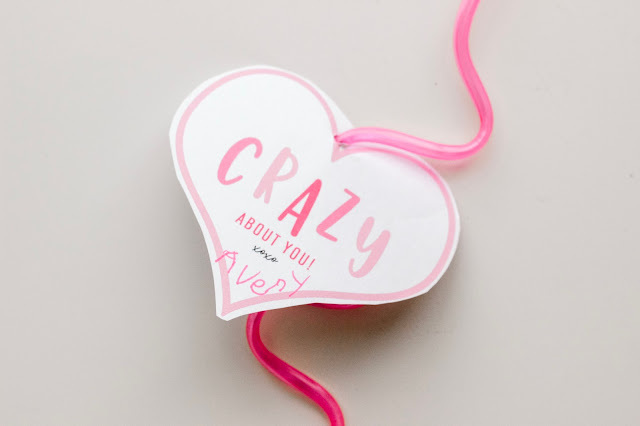 For more Valentine's Day decor and card ideas, come see what I've been pinning on Pinterest! That one was Avery's favorite- so fun and actually useful too! These are all awesome. I saw those bubbles at Target this weekend. Love these ideas! We purchased those princess ones so this is perfect! The little heart bracelets are the perfect touch, I can't wait for the girls to hand them out at ballet this week! Thanks Kristi! We just delivered the Crazy Straws to our neighbor friends today and the straws are a big hit with kids of all ages too!